The return of certain competencies to member states: The possibility of this was already hinted at by Angela Merkel during the recent election campaign but the CSU are going one step further by providing some additional details by specifying regional policy (as recommended by Open Europe and Open Europe Berlin) and "parts of the over-regulated single market". It is not clear what exactly would come under the latter category but it is possible that it could include areas like social and employment law which are not strictly part of the single market but which have come to be seen as ancillary to it. A new EU "subsidiarity" or "competences" Court: Der Spiegel quotes the paper as saying that "We need a form of withdrawal therapy for Commissioners intoxicated by regulation". The antidote it would seem will be a new EU subsidiarity or competences Court - composed of national constitutional judges/legal experts - which would mediate in cases where the Commission has allegedly overstepped its limits. This option has been voiced in Germany before but it looks like the CSU will give it a serious push. If combined with new powers for national parliaments, such as binding 'red card', this could be an effective way of keeping the Commission's desire to accrue new powers in check. The paper also strongly reiterates the party's support for referenda to be held on EU issues in Germany and for shrinking the EU Commission. Given that Cameron has not enjoyed the best headlines in Europe recently this late Christmas present will be very welcome at Number 10. Tories' Polish allies label Cameron's migration comments as "unacceptable"
Much has been said and written about EU free movement, indeed the rhetoric has escalated in the weeks before the lifting of transitional controls on citizens from Bulgaria and Romania. The question of on what terms EU migrants should be able to access the UK's welfare system - a crucial and sensitive issue - has been rolled into a wider debate about the costs and benefits of immigration per se. While the tough message adopted by the government is designed to reassure a concerned public that EU migrants will not be a drain on the public purse, this has also generated a lot of concern among EU partners. While protests from the likes of Viviane Reding and Laszlo Andor will not cause anyone in Whitehall or Westminster to loose any sleep - in fact quite the opposite - the reaction from broadly sympathetic EU partners like Germany and the Netherlands ought to. 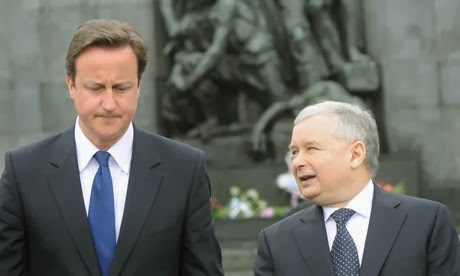 Today, even Poland's largest opposition party Law and Justice (allied with the Conservatives in the European Parliament) stuck the boot in, letting it be known that leader Jaroslaw Kaczynski had personally written to Cameron to complain after the Prime Minister described Labour's decision not to apply transition controls to the A8 countries in 2004 as a "mistake" and a "shameful dereliction of duty". "If Cameron does not revise his view on this subject it will make working together in the European Parliament exceptionally difficult". "This is a completely mistaken diagnosis of the situation. The British economy has earned billions of pounds thanks to the work of Polish migrants over the past 9 years... I think the letter from [former] Premier Kaczynski will provide Prime Minister Cameron with some valuable material." He added that he hopes the Polish government would also protest against Cameron's words which "are hurtful to the hundreds of thousands of Polish citizens who are working to advance the welfare of the UK". Of course Law and Justice cannot afford to be seen giving Cameron a free pass on rhetoric that is seen as being hostile towards Polish citizens, so the tough tone is partially for domestic consumption. It remains to be seen whether the two parties really will struggle to work together within the ECR group. Former Polish President Lech Walesa also joined the fray, accusing the UK of not appreciating how much they've benefited from the fall of Communism and of behaving "irrationally and short-sightedly". The wider risk - as we've pointed out in our recent briefing analysing the results of our simulated UK-EU negotiations - is that Cameron's tendency to jump from headline to headline when it comes to EU issues risks alienating potential allies in his bid for reform. Many may ask, does the EU even have its own credit rating? And if so why? The answer is, of course it does, although why is a bit more ambiguous. It relates mostly to the rating of the EU budget and any bodies which borrow with EU guarantees. This includes the European Financial Stability Mechanism, the smaller €60bn bailout fund which is backed by the EU budget. The first couple of points are obvious: the on-going financial and political instability in some states has led to the downgrade. This is par for the course in terms of ratings. It’s also obvious that the EU rating would be reflective of the ratings of its largest members, some of which have seen downgrades over the past year. However, it then gets a bit odd. S&P cites the EU budget negotiations, which were admittedly tricky and divisive, as an example of declining support for the EU. Firstly, the budget negotiations are always difficult but were eventually concluded and were pretty much wrapped up early this year. It’s also a bit strange given that the budget cannot run a deficit and countries are obliged to contribute – it’s not clear exactly how this relates to a credit rating issue. The final point S&P raised was the issue of ‘Brexit’ and how the UK referendum could create uncertainty. Again this is some time away so the timing of the decision seems strange. Nevertheless, it does drive home an interesting point, in that S&P believe the EU would be less creditworthy without the UK. Something for members to ponder as the push for reform begins to get underway properly. In any case, the main impact is likely to be symbolic. S&P have choice timing delivering the news on the same day when there was much backslapping and congratulations over reaching a deal on the banking union. Can David Cameron 'go nuclear' and use the Parliament Act? Is David Cameron preparing to go nuclear? The Telegraph reported yesterday that David Cameron has told his MPs that he will use the Parliament Act to force through James Wharton's Private members Bill for an EU Referendum? Inevitably described as his 'nuclear option'. Assuming their Lordships reject the EU referendum, which given the number of former Commission employees, diplomats, MEPs and quangocrats in their noble ranks must be a possibility, how will this work? Firstly, the Parliament Act, as amended in 1949, means that a Bill that has been rejected twice in consecutive sessions of Parliament by the Lords, should be presented to Her Majesty for approval whose official will by convention say or attach the wording "Le Reyne Le Veult" - to express, in Norman French, that the Queen will's it - in this case a referendum on EU membership. Reading the legislation there are a few pitfalls. The Bill needs to be presented in exactly the same form in the next session of Parliament. This will require the same rigmarole as this time, a new Conservative backbench MP taking up the Bill in backbench time, and further votes which will require another abstention by the majority of Labour MPs. Once that is done two remaining questions remain. Firstly, can you Parliament Act a private members Bill? And if so does the Coalition Government, or a Government Minister need to assent? Secondly, can the Conservatives force it through before the 2015 General election? Can you Parliament Act a private member's Bill? Under the legislation the Act refers to 'Public Bills' and does not specify they have to be 'Government' Bills. It also states a Bill "shall, on its rejection for the second time by the House of Lords.. be presented to His Majesty and become an Act of Parliament on the Royal Assent." So no need for Government approval. Will there be enough time? The Current session runs until May when the Bill's second session will start. That will give the Conservatives a year to get it through the Commons and into the Lords before the election. If it is still in the Lords when the general election is called in May 2015, it could be Parliament Acted as one of Parliament's last acts before it is dissolved for the election. What if the Lords run out of time but do not reject it? The Current session of Parliament runs until May, so it is possible the Lords will still be discussing it at that point. In this case the Bill is treated as rejected (s.2(3)). The same would apply if it is still in Parliament in 2015. Could John Bercow MP - the Common's speaker - have a role? Lastly, if all these things happen what will it actually mean? As we have said before, it will certainly be symbolic and will have obvious political benefits for the Conservatives, but could it bind a potential Labour Government? Well probably not, and in any event even if it becomes law it would require further votes after the election. So important and symbolic yes but if this Bill becomes an Act it will not make a referendum a certainty. A deal emerges. It seems that the negotiations are finally coming to a conclusion on the issue of banking union – after just a year. There has already been lots of coverage of the details of the deal, see in particular the excellent summaries from the WSJ and the continued coverage from the FT Brussels blog, so we won’t bother rehashing all the specifics here. Instead we’ll provide some analysis of the deal and flag up what we think are the most important implications. First point to make to those who are frustrated about this deal not going far enough: what did you think realistically could happen? The deal is not that different from the previous version which we laid out here, although a few (if not all) of the unanswered questions have been cleared up. Earlier this week an agreement was reached on the structure of the funds. It was, as expected, decidedly German. A €55bn fund will be built up from levies on the financial sector between 2016 and 2026. In the meantime, any funding required to aid banks above bail-ins will come from national coffers or ESM loans to sovereigns. Only after 2026 will a centralised fund be created and while there may be some mutualisation, it is yet to be defined and will be subject to future negotiations. There is also scope for national funds to lend to each other but this is to be defined in an intergovernmental treaty. 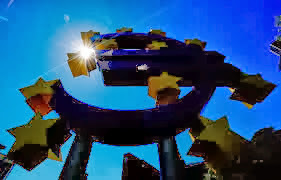 The decision making process will be thus: as supervisor the ECB recommends a bank be resolved, the board of national resolution authorities devises a plan and votes on it ( any release of funds will require approval two-thirds of voting countries contributing at least 50% of the common fund). This will then have to be approved by the Commission. If there is a dispute at any stage of this process the Council of EU finance ministers will decide on simple majority (if not then it will approve through a ‘silent procedure’). Well, we’re seriously at risk of repeating ourselves here, but here we go. A deal is positive and necessary. 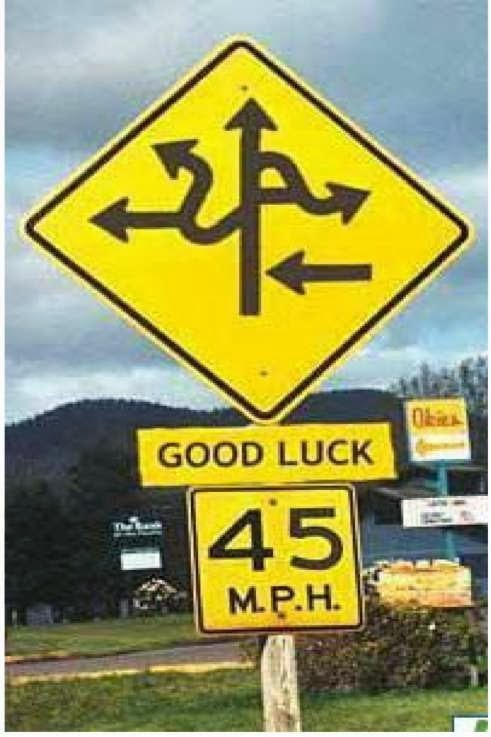 That said, the process remains incredibly complex and still seems highly national or intergovernmental. If there was a serious failure of a large cross border bank, such as we saw with Dexia, would the process really be any smoother or simpler than last time around? The funding remains minimal and only enough to cover the resolution of one or two medium sized banks. It will also not be available for some time and certainly will have little role in helping to deal with any recapitalisation costs outlined by next year’s stress tests. Taking a broad view, it’s easy to question how cross border this ultimate banking union is. The single supervisor under the ECB will only cover the largest 130 banks. The resolution mechanism will cover the same banks, plus another 200 or so which are cross border. However, there are around 6000 banks in the eurozone, and the very large majority of these remain under national purview. Generally, this also raises questions about how effectively the ECB can do its job as national supervisor. While the cracks in the system could push it to be harsher to ensure there is not a systemic crisis, it also poses problems given the current issues on bank balance sheets. It is crucial that next year’s stress tests are credible, if the ECB shows signs of insecurity about the ability to deal with a large bank recapitalisation it could raise questions about the process. Clearly, given the intergovernmental nature and the prevalence of national governments it is likely to be insufficient to break the loop between sovereigns and banks in the eurozone. How about for non-euro countries? Again we have outlined these points before. It seems that they managed to secure specific protections to ensure they will never be on the hook for eurozone banks, which is good but also the absolute minimum that should be expected. The use of an intergovernmental treaty is tricky. It side-lines these countries somewhat but also shows the limits of what the eurozone can do within the EU treaties. The creation of the resolution board as a new agency within the Commission does raise some concerns. It is clear it should be its own separate institution for the eurozone only, however, the lack of willingness to open the treaties has created this system. If the eurozone continues to push new institutions into older ones and distort the structures of the EU for eurozone use, it could become problematic. 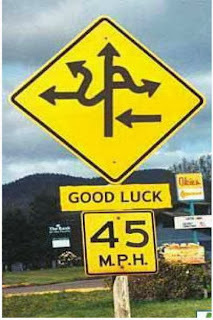 It also creates a complex and ineffective decision making procedure for the eurozone as is clear above. Germany. Plain and simple. For all the talk of a compromise earlier this week, it was incredibly minimal compared to how closely the plans as a whole match the German desires. Think back to the original Commission plan, which was incredibly centralised. We said then it wouldn’t fly with Germany and it hasn’t. The structure is intergovernmental, has minimal pooling of funds, is built up overtime, excludes smaller banks, does not include direct bank recapitalisation from the ESM and has a large bail-in element. All key German demands. They have made a vague promise to have some sharing of funds in a decades time, the details of which need to be negotiated over and may be limited to an intergovernmental treaty. If there are any losers, then it is likely to be France and the Mediterranean bloc. They were pushing for significantly more pooling of funds and a more centralised process. That said, France did previous publish a joint vision of the banking union with Germany, which is not a million miles from the current structure. The deal also allows them some more scope to use bailouts rather than bail-ins if needed – something else they were keen on. As we have noted recently, 2014 is likely to be another year where governments come to the fore in eurozone. 2012 and 2013 were the ECB's years, where its actions held the euro together. With the focus now on growth, more emphasis will fall on the governments of the eurozone to develop a new structure and strategy to put the bloc back on a sustainable footing and a path to prosperity. 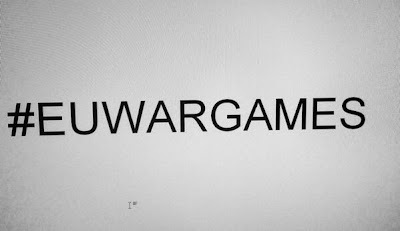 Our #EUwargames exercise has already received extensive coverage, but today we'll publish our own, widely anticipated, analysis of the simulation (within the next hour or so). 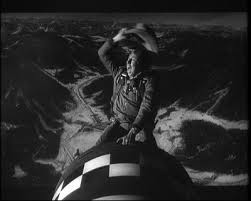 David Cameron heads to another EU summit today. The focus will be on the eurozone’s stuttering “banking union” but the PM will be stalking the corridors seeking support for EU reform. The good news is the appetite for change across Europe is growing. The bad news: Mr Cameron risks wasting the opportunity. In a unique exercise, Open Europe has just “war-gamed” UK-EU negotiations and the results were instructive. Once the posturing is over, there’s scope for a range of reforms, including cutting the cost of Brussels and veto rights for national parliaments. Mr Cameron has achieved an EU budget cut and financial services safeguards but the exceptional statesmanship required forsweeping reform is lacking. First, he’s fallen behind the curve. In January, he gave a good Europe speech but there was no follow-up plan. Mr Cameron had years to change the rules on benefit entitlements prior to Romanians and Bulgarians gaining full free movement rights but only now are changes being rushed through. Last-minute panic action will never deliver substantial reform. Second, there are government malfunctions. On EU migration the Home Office, the Department for Work and Pensions and No10 have pulled in different directions. All governments suffer from internal tensions, but multi-party coalitions such as the Dutch or Finnish are far more joined up on Europe. Finally, there’s a failure to understand EU partners’ interests. In our simulation, presented with evidence that France has the most to gain from limiting EU regional spending, Paris was open to budget reform. The UK must identify the reforms that could allow others to buy anygrand bargain. The deals are there to be done. Mr Cameron should appoint a lead negotiator or an EU reform task force to co-ordinate work across all departments and tour national capitals testing ideas. France has successfully defended agricultural subsidies for decades using this technique. Jumping from headline to headline may work for domestic issues but on Europe, it’s a sure way to end up pleasing no one. Angela Merkel this morning delivered her first Europe remarks at the helm of the new German Grand Coalition. It wasn’t a “Europe speech” per se but rather her usual pre-EU summit briefing in the Bundestag - although it undoubtedly had a bit more meaning since it is the first under the new coalition. First, she wants a Eurozone “banking union” to be agreed – and possibly up and running – at some point during 2014. However, as we noted in our pre-German election briefing, and which is most certainly being borne out by events, this is a watered down, very German version of banking union. This was clear from last night's (partial) deal on banking union (more on this later). So if you’re the typical Anglo-Saxon economist hoping for a big, joint backstop – don’t hold your breath. This one will be messy. "It is necessary to ensure that the required structural reforms are pushed through...[there must be] contractual agreements...We will be discussing such contractual agreements at the European Council for the umpteenth time... [I expect] to see progress." Translation: if you want us to underwrite the euro, we need 'see-you-in-court' style supervisory powers, firmly grounded in law. That means, EU treaty change. 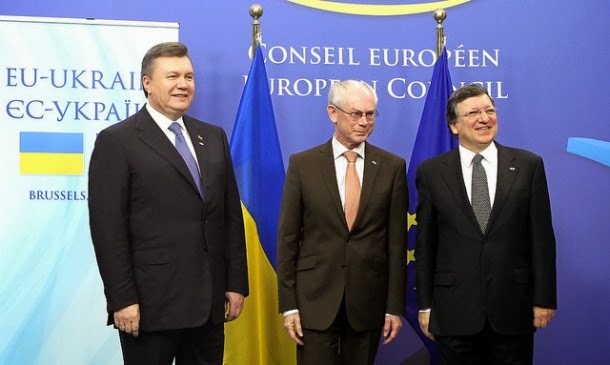 A deal between the EU and Ukraine involving a "deep and comprehensive" free trade area, finally seems to have the hit the wall, after weeks trying to reach an agreement. Ukrainian president Viktor Yanukovich is now looking increasingly likely to sign a deal to join the Russian backed customs union instead. As the Russian deal is a customs union it is incompatible with Ukraine signing an individual agreement with the EU. Any further negotiations with Ukraine will therefore need to be jointly negotiated with Russia – something unlikely to prove easy. Kiev (or its President) has chosen Russian over EU integration. Ukraine is a big country and market, with 45 million people and substantial resources. It’s also a geopolitical hot spot, it looks both east and west, parts speak Ukrainian and are historically linked to existing EU members, Lithuania, Hungary, Austria and Poland. Other parts speak Russian and historically look to Moscow. The EU’s “soft power” foreign policy – luring countries in by offering them gradual access to or membership of the EU’s zone of stability and trade – has hit its limits. EU enlargement as a foreign policy tool – betting on others voluntarily imitating the EU – worked as long as it could offer a haven to post-dictatorship countries in the Mediterranean and Eastern Europe, but without confronting the geopolitical orbit of hard power. With Ukraine, it has come up against precisely that in the form of Russia. Moscow offered its neighbour a binary choice: us or them. In a region still responding more to the whip than the carrot, the EU’s soft power proved highly limited. No amount of tweeting from constructivist-inclined EU foreign ministers will change that. However, there’s a second way to look at it. The hundreds of thousands of pro-European protesters taking to Kiev’s streets show that, in fact, EU soft power is alive and well. Or at least, people in the EU’s neighbourhood still have a desire to join the club in some form. Therefore, and paradoxically, the stand-off between the EU and Russia over Ukraine simultaneously illustrates the EU’s greatest weakness and its greatest strength. One final thought: I very much doubt that the protesters lining Kiev’s streets are voicing their support for the country joining the European Economic and Social Committee, or are particularly keen on plans to ban national flags (such as their own) from packs of meat, enforce quotas in boardrooms or prohibit refillable olive oil jugs in restaurants. They want to join a European club, broadly defined. Those who press for more EU integration and increasingly want to make the EU an extension of the single currency should be aware that they’re also creating more hurdles for newcomers to join such a club. So far the “widening” of the EU has also led to “deepening”. With countries like Ukraine and Turkey in the game, that simply cannot continue. Scaling back the EU’s rulebook and allowing for differing levels of integration would lower the barrier to entry and therefore allow Europe to continue to use enlargement as a foreign policy tool. The EU should want Ukraine and Turkey in but this won't happen as long as "ever closer union" is the mantra. A new flexible model of membership is needed. 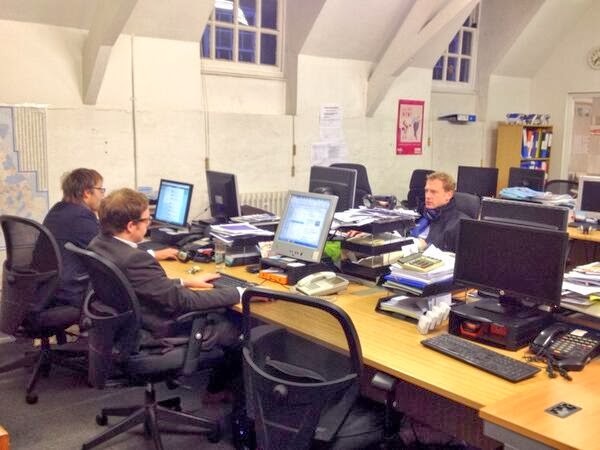 It is also one that may help to some existing members feel more at home in the club. Over the weekend, following the 'yes' vote among the SPD membership, the composition of the new German cabinet was announced – almost 3 months after the election. Despite, the outcome being broadly known there were a couple of surprises. Below we analyse the key points and personalities. This is probably the biggest surprise and could have some knock-on effects. Asmussen has stressed that he has stepped down from the ECB Executive Board to become Deputy Labour Minister (definitely a step down) for purely personal reasons. However, speculation will certainly arise over whether playing the bridge between the ECB and the Bundesbank had taken its toll on him. The immediate front runner for the post is Sabine Lautenschläger (right), vice-president of the Bundesbank, although her nomination is not guaranteed since it has to be approved by all ECB members and get a (non-binding) endorsement from the European Parliament. If she does take up the post it could create headaches for ECB President Mario Draghi with the Bundesbank well known for its hawkish approach and its (sometimes open) disdain for the current loose ECB monetary policy. It could also be the case that the CDU/CSU only consented to the SPD's Andrea Nahles - who had adopted an aggressively leftist position on the eurozone and German economy during the campaign - becoming the Social and Employment Minister on the condition that Asmussen would be there to push continued structural reforms. First female defence minister – a successor emerging? Another surprise was the appointment of Ursula von der Leyen as Defence Minister - the first time the post has been held by a woman. This remains a high profile and tricky position in Germany, with a significant international element. Von der Leyen has already been tipped as a potential successor to Merkel and this post could be the making, or breaking, of her. Either way, it shows Merkel accepts the need to cultivate potential successors, something she has previously avoided by side-lining the careers of those who have sought to take up the mantel. Von der Leyen is an outspoken supporter of European integration so it will be interesting to see if she pushes for more EU resource sharing and/or competence pooling in this area. 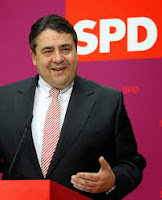 SPD Chairman grasps a double edged sword? In addition to his role as Merkel's deputy, the SPD's Chairman Sigmar Gabriel will head up the newly created post of Economy and Energy Minister – hence his new “Superminister” moniker. This is clearly a high profile role, with Gabriel now in charge of the Energiewende – Germany’s shift away from nuclear and fossil fuels to renewable energy. It provides a great platform for him to launch a campaign for the Chancellery in 2017. That said, the move could also backfire. There are already rumblings in Germany about the cost of energy, a problem which will also increase with the shift to renewable energy. Furthermore, implementing the shift will present numerous problems and Gabriel could become the fall guy for any failures. As for the economy brief, the Finance Ministry has a strong hold over many economic matters and Gabriel could find his hands full with the energy brief. As expected the SPD’s Frank-Walter Steinmeier returns as Foreign Minister, who we have noted before has a Francophile streak and has previously shown a willingness to disagree with Merkel. While his impact could be limited due to the Foreign Ministry being side-lined on EU and eurozone issues – now the domain of Merkel and Schäuble – Steinmeier could still work to rebuild the partnership with French President Francois Hollande. Other notable points include the appointment of Peter Altmaier to head the Chancellery (i.e. become Chief of Staff to Merkel). He has a keen interest and knowledge of the EU, but as previous head of the German arm of the European Federalists, he could provide a further challenge to UK Prime Minister David Cameron’s push for EU reform. The outspoken Hans-Peter Friedrich has been moved from the Interior Ministry to Agriculture, a less high profile post after he took significant flak for his handling of the NSA spying issue. Viewed from London this is a regret as Friedrich took a hard line on the need to reform EU free movement rules to prevent abuse by so-called 'welfare tourism'. Overall, the CDU holds five ministries, the CSU three and the SPD six. Much has been made in the negotiations about Merkel giving up too much power, but we’d be careful of underestimating her. Given her strong position it’s unlikely she would have given up more than is necessary, and she has maintained hold over the key ministries and the key points of the agenda. There has been some tinkering on the edges of labour policies and spending priorities, but the approach of cutting the deficit and bringing down debt remains vital. Her procedural step by step approach also remains. One thing that is clear is that the SPD is heavily invested and supportive of this coalition and there can be no chance of them shirking their responsibility. Whether this will prove positive for them at the next election remains to be seen. 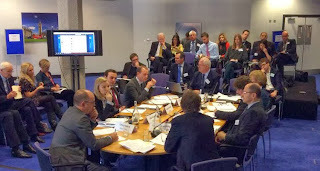 Open Europe's first ever simulated negotiations over the UK's future in the EU have generated a lot of buzz. 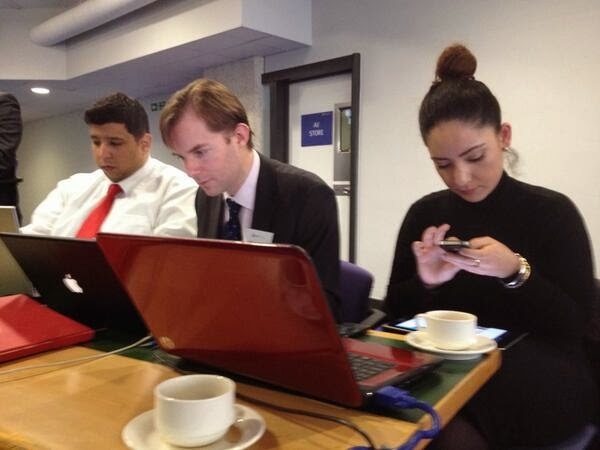 Check out this awesome #EUwargames twitter conversation for example. We very much appreciated all the positive feed-back. However, there was something a bit "duck-like" about the OE team ahead of the event: calm on the surface, paddling like the dickens beneath. 1600hr: The Nordic negotiator - Swedish shadow Foreign Minister Urban Ahlin - is forced to cancel due to having to fly out to Johannesburg to attend the Mandela memorial service. (Unlike some other leaders, we're yet to receive photo evidence of this...). 1615hr: Cue furious attempts to find replacements. 0800hr: An emergency COBRA team meeting is called. With less than 48 hours before the event, the Open Europe team launches its contingency plans to replace our two casualties. 1300hr: After a flurry of phone calls and emails, no luck. 1900hr: Now with many OE team members on numerous MPs blacklist for essentially stalking them, still two negotiators down. 0800hr: With less than 24 hours to go, the French and Nordic replacements are still yet to be secured - jittery times in the office. 1200hr: Panic spreads. OE team member found rocking and crying in the corner of the office...we won't name names. 14:00hr: With some 15 hours left to launch, finally a breakthrough. We've managed to conscript one or our original top choices Vivien Pertusot, who heads the Brussels office of the French Institute of International Relations. 15:30hr: Another break-through. Ebba Busch, a prominent member of the governing council of the Swedish Christian Democrats, picks up the mantle and hops almost immediately on a plane to London. Fantastic news and (as they both proved in the event) more than adequate replacements. 0600hr: Three hours before launch, the phone rings. Fog in the channel (Heathrow), Europe cut off! British weather seems determined to sabotage the event with Ulrich Speck, our German negotiator, grounded in Frankfurt. 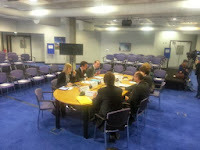 0700hr: Open Europe team gathers (eventually, note the empty seats...) in the headquarters for a pre-game briefing. Mood is cautiously optimistic, but the 'German question' remains unresolved. The COBRA unit decides that our moderator John Hulsman, who has lived in Berlin for some time, steps in to play a holding role. 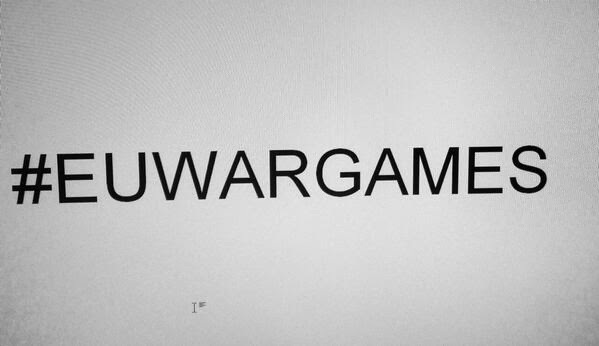 0800hr: Concerns that the 'war games' concept could send the wrong message is taken on board but aggressively dismissed. @OpenEurope @matsJpersson Interesting exercise but isn't title #EUwargames a bit extreme? Sounds like aggression & fighting not negotiation. 0830hr: Negotiators gather for a pre-game briefing to set the rules of engagement. Anticipation growing. Someone seems to have had some fun with the seating, with the UK and France directly opposite each other and Germany at the top of the table. 1030hr: Britain's Andrea Leadsom opens with a broadside against the EU's inefficiencies and bloated bureaucracy - but ensures the tone remains one of reforming the EU to improve it for all. With negotiations in full flow, Germany arrives! Ironically fashionably late. 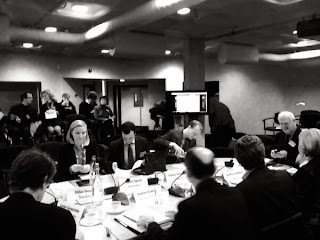 Although the actual negotiations did get a bit feisty - France was unsurprisingly hostile to any UK demands - thankfully no blood was actually shed, with John Hulsman doing a good job of keeping the peace around the table. Meanwhile the Open Europe team (below) was on standby to provide assistance to the negotiators, much like Sherpas would do in real EU negotiations. Fortunately no-one was required to hide under the table, as in the Major days. To add a further dose of realism negotiations drag on longer than expected as Open Europe's best laid plans and timelines go out the window - why buck the trend? Despite this the negotiators made good progress though certain Continental habits took hold. 1500hr: Following a cabinet reshuffle during the lunch break, negotiations over a 'Brexit' commence. Despite another strong opening from the UK, this time represented by David Heathcote-Amory, a sombre mood prevailed with many players regretting the UK decision to exit. Hans Kundnani, now playing Germany, brightens the mood evoking the spirit of Merkel and reminding all that he is "a rational woman". After eight hours of gruelling negotiations the second scenario finally wraps up. With lots of ground covered and the negotiators suitably spent from battle everyone retires to the pub for a debriefing - peace breaks out over beer as is the age old tradition. In a few weeks time, the transitional restrictions on citizens from Bulgaria and Romania gaining full access to all EU member states' labour markets will expire. As we have covered in our press summaries and on our blog, it's not just in the UK where this has led to political upheaval. Last week, European Commissioner Viviane Reding finally responded to concerns expressed by the UK, Germany, Austria, and the Netherlands back in April about benefit tourism in the EU. Although she was right when saying that “free movement is a right to free circulation; it is not a right to migrate in member states' social security systems”, her actual policy proposals aren't terribly convincing. That throwing more money at the problem isn't going to improve things shouldn't need to be said, especially given the sorrow state of the EU budget. 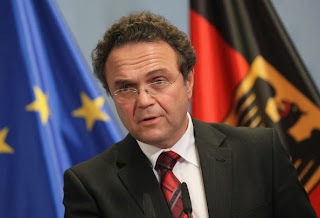 The UK, is according to EU officials, "very disappointed with the scale and ambition", while German Interior Minister Hans-Peter Friedrich reacted by saying, "To launch discussions or to develop brochures won't suffice". What Germany will do next most likely depends on how smoothly the "second accession" of Romania and Bulgaria in January goes, but in any case the German coalition deal doesn't leave any room for doubt that it is determined to do something about it if problems arise. Friedrich has threatened to work with other governments “outside the structures of the EU” if the Commission doesn’t respond adequately to concerns about welfare tourism - another signal that Germany is ready to resort to intergovernmentalism as it has signalled it will do with the banking union, at least for now. Dutch Interior Minister Lodewijk Asscher, who has been making many similar noises to the UK and Germany, thinks that more Romanians and Bulgarians will come to the Netherlands than has been predicted. He said, "The official predictions are low, but earlier predictions weren't correct either." He added that he would have liked to extend restrictions for Romania and Bulgaria, but "if you have an agreement with other countries, you should stick to it". However, local authorities in the Dutch cities of Rotterdam and The Hague are reportedly ready to defy EU law by denying tax or social security numbers to Romanians or Bulgarians who fail to pass housing and employment checks. Meanwhile, today, UK Work and Pensions Secretary Iain Duncan Smith has announced that new migrants will be asked to prove that their English language skills will be no barrier to them finding employment in Britain, under plans to strengthen the UK’s Habitual Residence/Right to Reside Test. The Dutch coalition agreement already states that "Individuals who cannot speak Dutch will not receive social assistance benefit. This principle will be applied consistently: to EU nationals, third-country nationals and Dutch nationals." 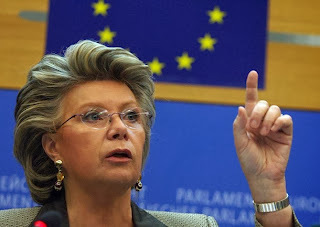 The European Commission's run-ins with the UK, over the 'right to reside test', and Germany, following which Friedrich accused Commissioner Reding of "ignorance", highlight the level animosity its approach has caused. The EU Treaty doesn't need to be re-written to deal with this issue. We've made a few suggestions here that the Commission would do well to engage with it if it really cares about maintaining support for free movement in Europe. The macroeconomic scenarios include some optimistic export numbers. As we have said before for Slovenia, and others, relying on exports alone to prop up GDP can be a risky game. The tests are based on data from the end of 2012. This is a problem with these tests in general, but has been exacerbated by delays in the case of Slovenia. 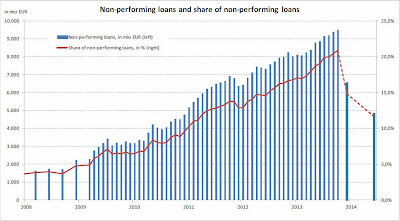 The data are one year out of date – a year where the Slovenian economy has struggled, and non-performing loans held by banks have increased steadily. The €4.8bn figure is taken from the adverse scenario, and it's not exactly clear why this is done when the figures shown under the base scenario are normally used in these tests. This could be seen as an attempt to be 'extra conservative', or a sign that the base case is a bit outdated in terms of projections or data. €3bn of the money will come from the government and be injected into the three largest state-owned banks (NLB, NKBM and Abanka). €2bn will be in the form of cash, with the rest in the form of government securities. A further €441m will come from a 100% write-down of subordinated debt. 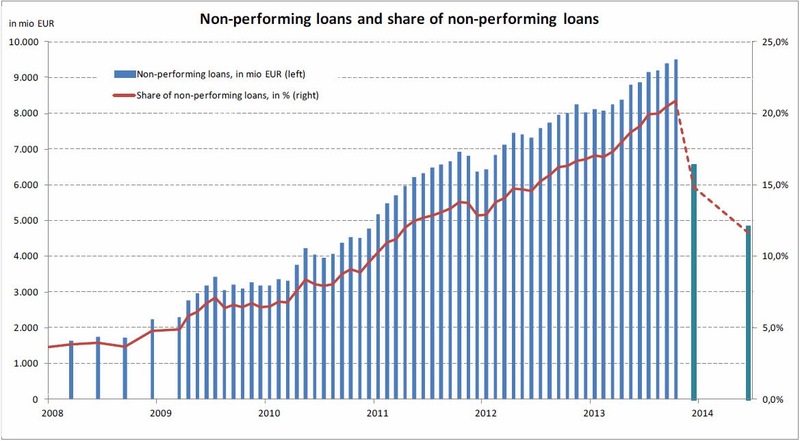 The largest banks will also transfer €1.7bn in non-performing loans to the country’s bad bank – exactly what price this will be at remains unclear. It is also unclear if the bad bank will require further state support. Overall, this is a huge amount of support for the largest banks in the sector. The remaining small banks will be forced to raise around €1.1bn through private sources before June 2014. 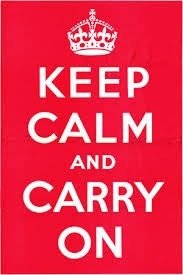 If they fail, then the government may step in once again (although this will certainly involve further bail-ins). As a result of this bank recapitalisation, Slovenia's government debt will rise to 75.6% of GDP. Not massive by standards of the eurozone crisis, but high enough that we could see upward pressure on borrowing costs, especially given the poor growth outlook for the economy. It also means that both the public and private sector in Slovenia is heavily indebted. This risks weighing on the economy, and could potentially create a downward spiral as domestic demand, investment and government spending falls. One of the more astonishing figures (to us) is that the stress tests cost €21 million (around 0.06% of GDP) to conduct, due to fees for the consulting firms such as Oliver Wyman, Roland Berger, Ernst & Young, and Deloitte. So far, then, Slovenia has managed to avoid the need for external aid, despite a significant overhaul of its banking sector. However, the economy remains in a fragile state, and any shocks to the system over the next six months, as the overhaul takes place, could push the economy into a wider and deeper crisis. Eurozone finance ministers yesterday took a belated step towards the key part of the banking union, the single resolution mechanism (SRM), with many reports suggesting that the broad outlines of an agreement have emerged. We’ve written about the background to this extensively, see here and here for example. As a recap, a deal was expected to be completed by the end of the year so that the framework is in place for after next year’s ECB Asset Quality Review and EBA bank stress test. This now looks unlikely, with technical details being ironed out into next year, but there is still hope for a political agreement at the EU Council on 19 December. What are the key points of the latest agreement? The latest official draft of the plans was published early last week and things don’t seem to have changed massively. A board of national resolution authorities will make recommendations on how to resolve banks (after the ECB as supervisor recommends the need for action). The Commission then decides whether the plans are adequate or not. There will not be a centralised fund, at least not immediately. As in previous plans, one will be built up over the course of a decade to €55bn, through undefined levies on the financial system. A network will be set up between national funds allowing them to lend to each other and take action when there is a crisis. This may be governed by a separate intergovernmental treaty, to assuage German concerns over its legality. 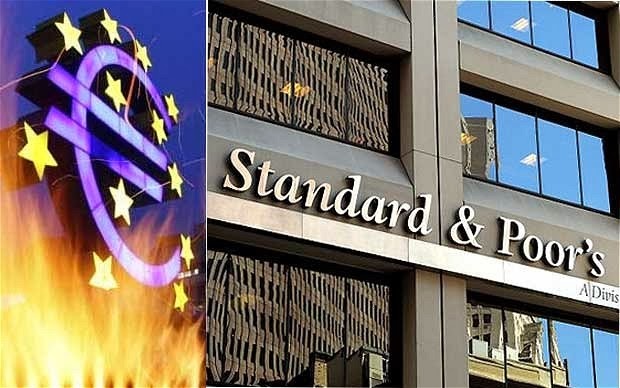 Taxpayer-backed funds remain a last resort, in particular European funds (either through the network or the ESM, the eurozone’s bailout fund), with bail-ins being the initial response. The plans for bail-ins, under the EU’s Bank Recovery and Resolution Directive, could be moved forward from 2018 to 2016 to help appease Germany further. What is still yet to be agreed? Numerous points remain unclear, not least, who has the final say if the Commission and national authorities disagree. If it involves national funds, it is almost certain to be national authorities. The exact process for triggering the use of funds remains unclear, particularly in a situation where the resolution process involves a large cross border bank. More importantly, if a new treaty is needed, the details of this need to be thrashed out – as we saw with the fiscal compact, this can take time and will itself require a tricky negotiation. It also needs to be decided whether this will be incorporated into EU treaties, as is planned for the fiscal compact. There continues to be talk of the SRM and its rules applying only to larger banks, similar to the setup of the ECB’s single supervisor. Has Germany really moved that far? Reports suggest a shift in the German position is the key factor behind the compromise. While Germany has clearly shifted a bit, it has also got plenty of things it wanted. Looking back at the proposal laid out by German Finance Minister Wolfgang Schauble in the FT in May, Germany has secured the following – significant national power, increased role for a board and less for the Commission as well as limited use of taxpayer funds, with no central fund. It could also potentially secure an SRM focused on larger banks and a quicker introduction of bail-in rules. It has of course compromised on its view that the treaties need to be adapted, after its position took a blow somewhat from the recent legal opinion on the issue. It has found a halfway house with the intergovernmental treaty, giving it some further legal protection. What would this deal mean for the eurozone? As we have said before, progress towards a deal is positive. But the deal still suffers from some key short comings namely: the system will not be in place for the immediate aftermath of next year’s stress tests, the system is still reliant on national authorities and ad-hoc measures as well as suffering from constraints in terms of reaction time in a crisis. Any funds, be they national or European or ESM, remain short of what is likely needed to help backstop and resolve any large failing banks in the circa €33 trillion eurozone banking sector. We remain unconvinced that this will be sufficient to break the sovereign-banking loop which has intensified during the crisis (breaking it remains the stated goal of the banking union) – national politics and money still has a huge role to play in this system. An important point to consider is that, given the current setup of the eurozone banking system, bank bail-ins remain, for the large part, national affairs. While this is separate to the sovereign-bank loop, it does highlight the tight feedback loops within many eurozone economies and could intensify the problem of nationally systemically important banks. This may change over time but is not guaranteed. What would it mean for non-euro countries? The use of an intergovernmental treaty is interesting and could have ramifications. While it is far from ideal for the eurozone, it does side-line the potential influence and control of non-eurozone countries. One potential upside is that the eurozone will not be able to force through its own institutions under the single market article (Article 114) which does highlight the limits to how far they can stretch this. The ad-hoc part of the agreement does fragment the process and fails to provide a systematic blueprint for how future institutional changes will address the EU/eurozone conundrum. Back in September, we wrote on this blog that the EU’s Financial Transaction Tax was “dying a death of a thousand cuts”. However, following that opinion of the EU Council of Ministers' legal service, the European Commission has hit back with its own legal opinion. We have got our hands on the full text, which can be seen here (thanks to Italian magazine Valori for posting it on its website). Despite this, we stick with our statement. For all intents and purposes, the extensive FTT that was initially proposed by the Commission seems to be dead as a policy. Indeed, it remains part of a rather heated technical discussion within the EU institutions - but we have already noted the likelihood of it returning in a much watered down version to save face of those invested in the idea. It is, therefore, a living dead policy – a 'zombie tax' if you will. The Council does not present any legal basis for its argument that the FTT breaches international law. The Commission stresses that the issue of “more relevant” right to impose taxes is not legally defined. The Commission essentially argues that its FTT proposal does present enough of a nexus between the state and the transactions to allow for taxation – specifically that the counterparty principle fits with international law. That the FTT does fit with the enhanced cooperation procedure since it does not stop non–participating member states from pursuing their own financial taxes. The first thing that is clear, is that this is beginning to become an intensely theoretical legal discussion. It remains important, but the practical and political aspects should not be forgotten. As we highlighted along with our exclusive release of internal documents earlier this year, one of the key reasons behind the loss of enthusiasm for the FTT was the economic impact. It became clear it is not practically workable in many cases, particularly due to its impact on repo markets as well as government and corporate bond markets. We also still strongly agree with the Council’s take. While in legal terms the impact on non-participating states can be fiddled, in real terms there will be a sizeable impact on the financial sectors of states explicitly opposed to the tax – something which remains politically explosive in terms of EU precedent. Again, with the FTT now slowly ambling along in zombie mode we’re sure this is not the last we have heard of it. Yesterday's Autumn statement revealed that, under the latest OBR forecast, the UK’s net contribution to the EU budget is set to increase by a cumulative £10 billion between 2013-14 and 2017-18. However, it is not quite as bad as it seems. According to the OBR, £4.9bn of the increase is “spending neutral” due to a change in how EU aid contributions are accounted for. 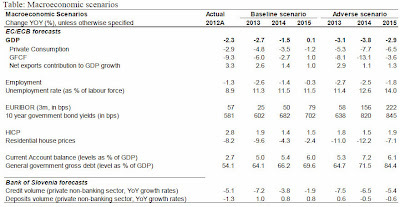 Nevertheless, the OBR does expect a real increase of around £5bn. This is due to lower than expected VAT revenues and customs duties (known as Traditional Own Resources) across the EU due to the economic downturn. The effect is that this will increase direct national contributions from the net contributors, including the UK's. Although much of the EU budget remains wasteful and irrational, these figures illustrate why it was so important to secure the cut in overall EU spending levels up to 2020. The deal brokered in February does at least mean that over the long term gross and net contributions will be limited in a way that they were not before. In addition greater pressure on overall spending might (we can hope) finally focus minds on reforming how the money is actually spent. Change in direction in UK wind subsidies? The BBC reported this morning an interesting development in UK energy policy. The UK government is set to shift its subsidies for renewable energy towards offshore wind, with support for solar power and onshore wind being cut. From 2015 the fixed prices for offshore wind will be higher, in the hope of driving investment. While this seems to be a UK only issue, as we have noted at length before, much of UK energy policy (especially on renewables) ultimately comes back to the EU’s overarching targets. Why not an overall cut? As is immediately clear, this does not increase renewable subsidies but it also does not cut them, it is as has been noted, a “rebalancing”. The main reason for this is that the UK still needs to meet its EU mandated target for 2020 of 15% of energy, and 30% of electricity, from renewables. If it has any hope of doing so, a cut in subsidies seems impossible. Given the size of the jump in electricity production needed (currently just over 11% is produced by renewables) offshore wind is the only realistic option. Solar is unlikely to ever be viable as a key source of electricity production due to the UK’s climate, while onshore wind is severely limited by the lack of viable sites which both provide enough wind and are politically acceptable. Will this have any significant impact? As noted above, this is mostly shifting around funding, albeit to possibility more realistic areas. That said, it remains incredibly uncertain whether offshore wind can deliver the level of electricity needed to meet the UK’s demand. Firstly, the costs of offshore wind look set to increase, this is because the wind farms are increasing in size meaning they need to shift to deeper water. Clearly, this means increased costs in terms of installation and maintenance (as well as some very serious technical challenges to be overcome). It will also increase costs of linking the farms back into the UK’s power grid. The working assumption from the government’s side, is that these costs and challenges will be offset by higher output due to more wind at the deeper locations, but there is little evidence to support this so far. Added to that increasing the subsidy at this point seems to imply that the costs of offshore wind will remain stubbornly high raising further questions about its long-term sustainability. Secondly, given the intermittent and uncertain nature of wind, the UK will need to install significant extra capacity as well as a huge standby energy reserve to ensure peak demand can be met. This will increase costs across the board. The hope is that these new higher prices will help drive investment into offshore wind. While action is necessary, it once again highlights that investment is lagging behind where it should be in the UK's vital renewable technology. It also adds to the growing anecdotal evidence that there are serious issues with attracting investment into the UK's energy market, at least under terms which don't involve higher fixed prices (see Hinkley Point C deal). The deal also does not bode well for the hopes of declining energy prices and bills in the future. It essentially locks in a price of £140 per MWh under offshore wind. This remains well above market prices for fossil fuels (its around £70 - £80 per MWh for gas) and keeps the price well above the target of £100 per MWh laid out under recent government studies. Any decrease in costs in the future is unlikely to filter through to prices. The key point here is that the UK government is trying to respond to the changing circumstances and changing public opinion, however, it remains locked into a very restrictive framework due to the targets agreed at the EU level. As we have said before, we can’t help but feel that as long as this is the case the UK’s energy woes, both in terms of prices and supply, will continue. The year is 2017. It's time to negotiate! Will Britain achieve a new settlement in the EU, and if not, on what terms would it leave? 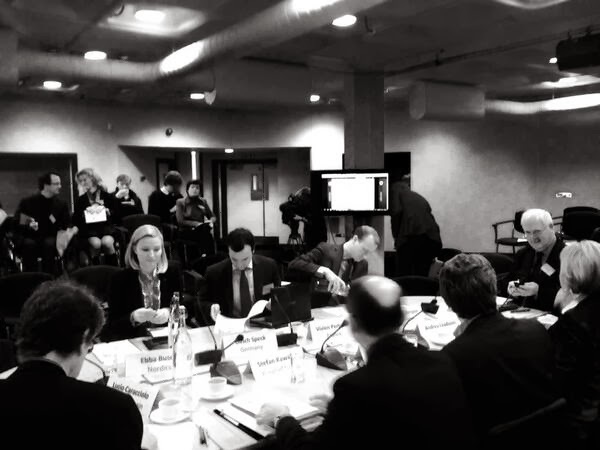 This is a unique chance to watch leading politicians, policymakers and experts carry out actual, real-time negotiations on the UK’s relationship with the EU – in a so-called war-game. Check out the trailer of this unprecedented event that will take place Wednesday 11 December in London. Secure your front-row seat now and witness the future of Europe unfold.